Homeland Security Secretary Kirstjen Nielsen said Monday that press accounts of family separation at the U.S. southern border are misleading and stressed that asylum seekers should use official ports of entry. Addressing the National Sheriffs' Association annual conference in New Orleans, Nielsen argued that many loopholes must be closed to stem the flow of illegal immigration. President Donald Trump's administration has faced criticism over its practice of separating immigrant children from their families when they are apprehended for crossing the border illegally. "You do not need to break the law of this country by entering illegally to claim asylum," she said. "If you are seeking asylum, go to a port of entry." Nielsen also said the administration must prosecute those who make false claims of being families or of needing asylum. "We do not have the luxury of pretending that all individuals coming to this country as a family unit are, in fact, a family. We have to do our job; we will not apologize for doing our job," she said. "If you make a false immigration claim, we will prosecute you. If you smuggle illegal aliens across an extraordinarily dangerous journey, we will prosecute you." A major problem in the system, Nielsen said, is the way asylum seekers with children are treated differently by law if they are from countries besides Canada and Mexico. "Under existing law, certain unaccompanied alien children from Mexico and Canada who enter illegally and have no valid claim to stay can be quickly returned home," she said. "But unaccompanied children from every other country in the world must be transferred to the Department of Health and Human Services within 72 hours and then released to parents or guardians within the United States. This is a significant pull factor that encourages these children to make the dangerous journey north, and it also belies the fairness of the system." Responding to media coverage of detention centers for illegal immigrant minors, Nielsen defended their treatment. "It is important to note that these minors are very well taken care of. Don't believe the press. They are very well taken care of," she said. "We operate according to some of the highest standards in the country. We provide food, medical, education, and all needs that the child requests." Traffickers and others can pose as families in order to game the system, Nielsen said, and they have become good at it. "When a child is apprehended with their parents, DHS is required, due to various court rulings, to release the child within 20 days," she said. "As I mentioned earlier, this get-out-of-jail-free card for families and groups who pose as families has spread. The word of this has spread. The smugglers and traffickers know these loopholes better than our members of Congress." 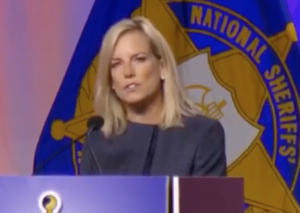 Nielsen said the expeditious return of children and a law change allowing children to stay with their families will help DHS deal with the problem of minors being used fraudulently. "These fixes would go a long way toward discouraging families from sending children on the harrowing journey to the U.S., resulting in fewer children in the hands of gangs such as MS-13 and more adults facing the consequences of their actions," she said. Nielsen brought up the generosity of the U.S. in taking in refugees historically, but she said the government needs to have standards beyond claiming credible fear to qualify for asylum. "Unfortunately, because we have an incredibly low standard for claiming credible fear as part of the asylum process, our generosity is being abused," she said. This has led to a backlog of cases that the U.S. is unable to process expeditiously. "Before 2011, approximately one out of every 100 people arriving illegally claimed credible fear and sought asylum in the United States. Today that number is one out of every 10," she said. "The result of such a low threshold for an initial credible fear screening is an asylum backlog of 600,000 cases."